Over the next couple of days we are going to start helping you get prepared for Halloween! There are some really cute, easy, fun Do-It-Yourself costumes out there and we want to share some of our favorites with you. 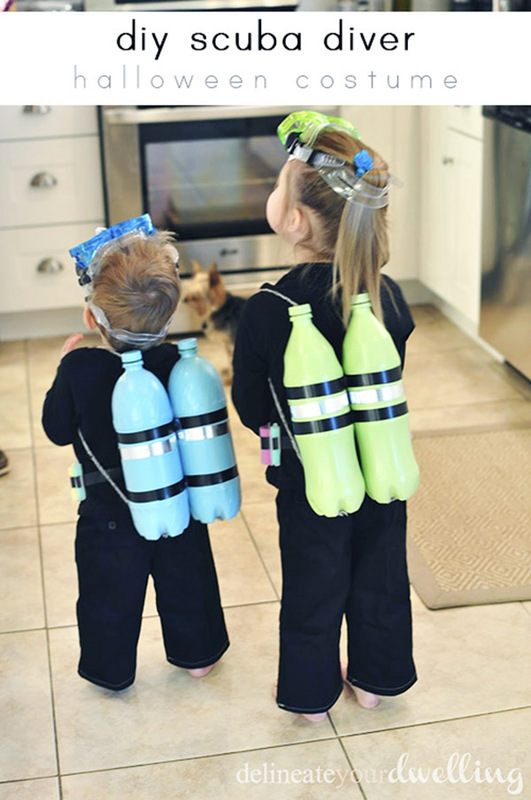 Prepare yourself to take on the ocean with this cute easy DIY Scuba Diver costume! This is one of the most adorable costumes out there. All you need is a black pants and matching long sleeve top, some old soda bottles, spray paint, electrical tape, rope, hot glue and matching colored goggles and snorkel set. Tape together the two empty soda bottles (once they are rinsed out of course), and spray paint desired color. Then secure with electrical tape around the middle. Use a hot glue gun to attach the rope to the top and bottom of each bottle to create arm straps. Once secured, accessorize with a belt, goggle, snorkel, and you are all set! Tip: You could always spray bottles with glow in the dark paint or fill with glow sticks in order for your little ones to be seen as they are out trick or treating. The joy of having them home and the joy of them going back to school. Moms need to celebrate too and for some, sending your child to kindergarten is tough and heart breaking, but celebration should be had by all. Plan a block party or invite your dearest friends or classmates mothers to nice coffee and mimosa after the kids are dropped off. You could have some little fruit kabobs and mini cinnamon rolls and their choice of drink. Hug a lot and talk about the upcoming school events. A nice little favor you could give each mom that attends is a little packet of lunch box recipes and ideas. Print them off or dress them up like a cookbook, but something they will use !! 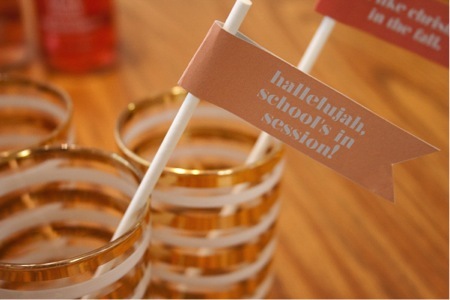 Back to school party can be done for any age group, for teachers wanting to have one more good time before class is in session or even for the Moms the day school is back in session. 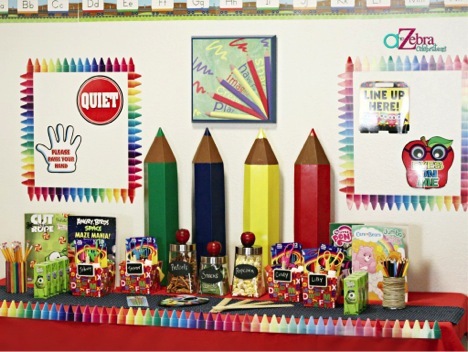 For the kids and teachers, planning the party to be like a mini school day can be a lot of fun….reading time, lunch time and recess time….then send everyone home with a goody bag that might include a pencil, eraser, a snack and perhaps a cute folder and writing pad. This week’s blog will include some ideas for this party and even for the Moms back to school party which could be mimosas and morning munchies, sending home a few lunch time recipes as the favor. Keep an eye out for the next blog this week – RECESS! The beach is always crowded during the summer, and sometimes it isn’t always easy to get the family together to go. You can always appease the questions about going by having your own celebration at the house! 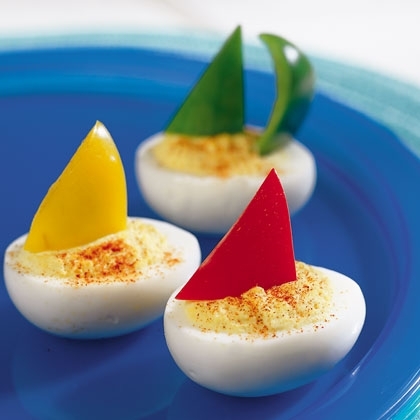 There are a lot of snack foods you can make that look like different nautical creatures, goody bags to give to the kids and decorative pieces to set up to give it a real beach experience. Keep an eye out on the blogs this week for more ideas and recipes on how to throw the ultimate beach party in your back yard! One idea for decorations is to make signs for each food item that contains a beach themed name such as Sandy Beach Burgers, Hang Loose Hot Dogs, Surf’s Up Salad, Fun in the Sun Fruit Kabobs and Catch a Wave Chip and Dip! You can use these or even come up with your own ideas. Go to the dollar store and pick up some new, small plastic buckets to use for snacks. Sand shovels could also be used as scoops and serving spoons. For some more fun ideas and recipes keep checking the blog through out the week! Now this one is definitely not one for the kids! We have a recipe for you that would be a great pool side addition to your party, or even just a relaxing day by the pool with family. Dissolve gelatin and sugar in boiling water, add mint leaves. Make sure to cover and steep for 20 minutes. Press through a sieve and discard the mint. Stir in limeade concentrate, cold water, soda and rum. Pour into a 2 1/2 qt. freezer container to freeze overnight or until set. 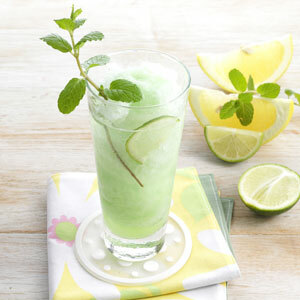 Scoop 2/3 cup slush into a glass, pour soda over it and garnish as desired. This recipe makes 13 servings! 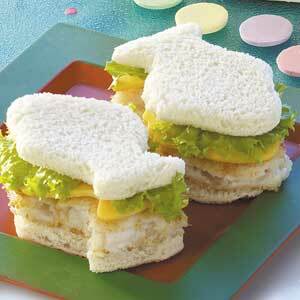 Another Recipe, this one for the kids, is Fish Shaped Sandwiches! Serving size for this recipe is six. Use directions on the package to prepare the Fish fillets. In a small bowl combine the mayonnaise, ranch dressing, relish and garlic powder. Spread over six slices of bread, place two fillets on each slice as well. Add cheese, lettuce and remaining bread. Using a 3 1/2 inch fish shaped cookie cutter, you can cut two fish shapes from each sandwich. Ready to serve immediately.All credit for the picture and recipe goes to Taste of Home.